I struggle with my thoughts. My mind has a tendency to run after its own things, to dwell on what isn't helpful for me. Sometimes these thoughts take the form of fears. Sometimes these thoughts take the shape of lies. Sometimes these thoughts take the shape of TV shows I probably shouldn't have watched in the first place. I love CSI, but my mind doesn't. Once a month or so I'll watch an episode anyway. I did this the other night and in my morning dreams, you know the vivid ones just before you wake up, the actions of a serial killer disturbed me once again. 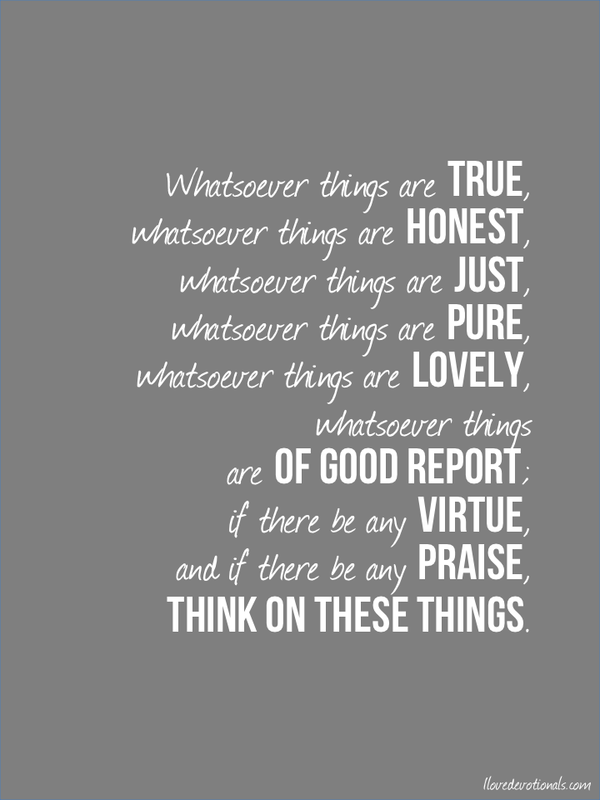 Whatsoever things are true think about such things. In place of images and fear I let bible verses run through my mind. I don't memorise as much scripture as I should, but I've found a good way to do it is to put the scripture somewhere I'll see it all the time: on my phone, on the mirror, next to your bed, above your desk. And whenever it catches my eye, I’ll say it three times, and then once from memory. This way when you find yourself in a situation where your thoughts aren't where you want them to be you can try and remember the verse you've been trying learn. Sometimes the thoughts I want to banish disappear like I’m switching off a TV, other times it takes a bit more discipline, sometimes it takes prayer, "Lord Jesus, help me to take these thoughts captive, bring to mind things that are true, honest, just and pure. Help me to focus my mind on what is lovely." It doesn't just happen, this training of the mind; it's hard work, it's discipline. But like most physical training, this spiritual training is worth it. Ponder: Will this tool help you train yourself to manage the thoughts you struggle with? 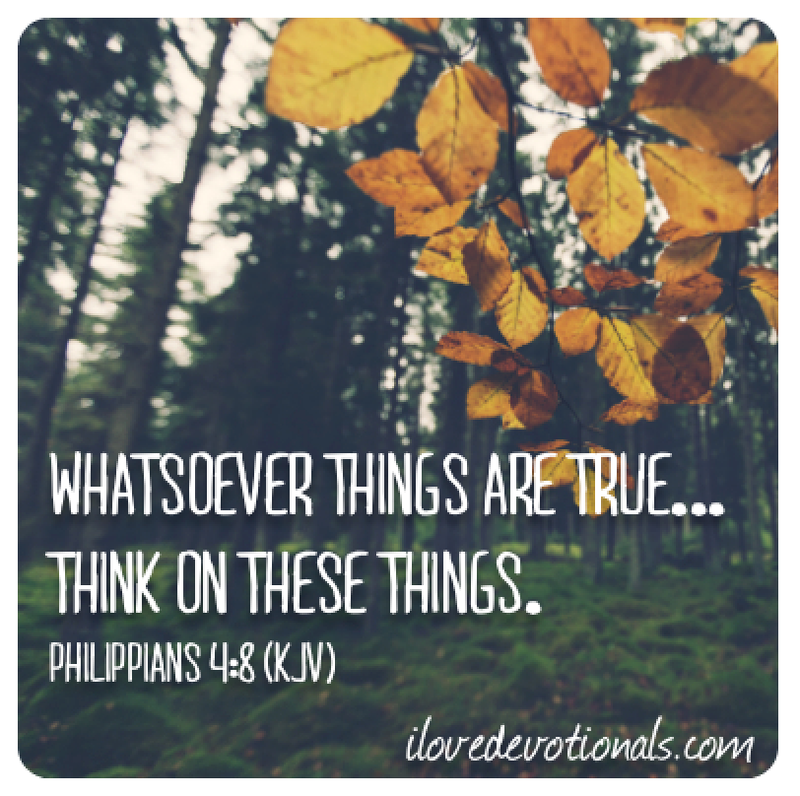 Prayer: Lord Jesus, help me to take these thoughts captive, bring to mind things that are true, honest, just and pure. Help me to focus my mind on what is lovely. Printable: If you want to start this practice today here's a FREE printable (in four colour options) to help you memorise Philippians 4:8. 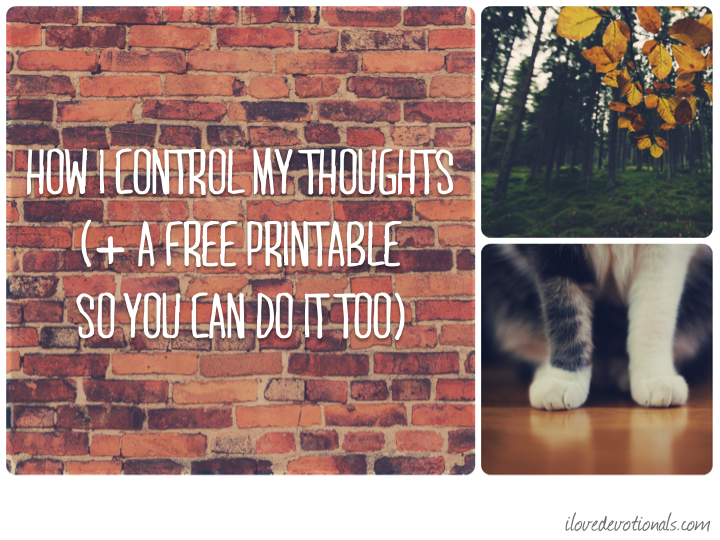 Tweet about this free printable.